Sell Annuity Payments If you are looking to sell annuity payments, there’s one key point to remember and that is that the payments are negotiable. Before we talk about that, also realize that you can sell all or part of your payments. 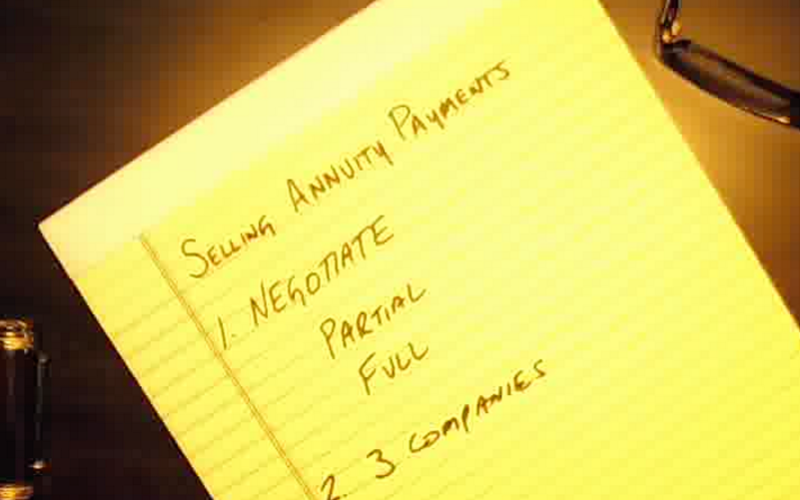 Sell Annuity Payments - Negotiate! We’ve all heard the radio or even TV commercials where the guy says to go find the best deal you can, and then come see me and I’ll beat it. What a lazy way to go about getting business. I wonder what he would say if you asked him to just give you the best deal he can and then you’ll go shop. How good would his best deal be then? By doing this, they only have to undercut the lowest deal you find, which may not be a good deal at all. When you are looking to sell annuity payments, the best way to negotiate is to not tell the people looking to buy anything. You are going to hear about discount rates, paperwork, time frames, going before a judge, etc. That’s all important, but the most important thing is how much are they going to give you. I recommend that you go to at least three companies. Tell them that you are going to shop 3 other companies and the one that pays the most will get the business. Keep in mind, this is a one time shot, and once it’s done, it’s done and there’s no going back. So get the most you can get while you can. If they ask you who else you are going to go talk to, tell them that’s none of their business. They don’t need to know anything else other than the fact that you are a shopper. Believe me, they know the competition and how much they offer and will shoot just below what they know the competition will come in at. By keeping them in the dark about who else you are talking to, they will have to give you a pretty good payout to be competitive. Do this with all three. Once you have all three quotes, then you can go back and tell them where everybody came in. They may counter and give you a better deal. Keep going back to each company telling them what the other is willing to do until they say we are not going to budge anymore. Then pick the one with the best payout.